Being unable to look for a Char Koay Teow that tastes as good as those in Penang is one of my major frustrations in food while working in Klang Valley. So I am glad to have found one that is able to fry up an authentic tasting plate of Penang Char Koay Teow, which is ironically so near to me all this time – the stall in Sun Hin Loong at SS2 just next to Watsons. I know this might be old news but this entry is actually dedicated to you Penangites out there who are working in Klang Valley like me. 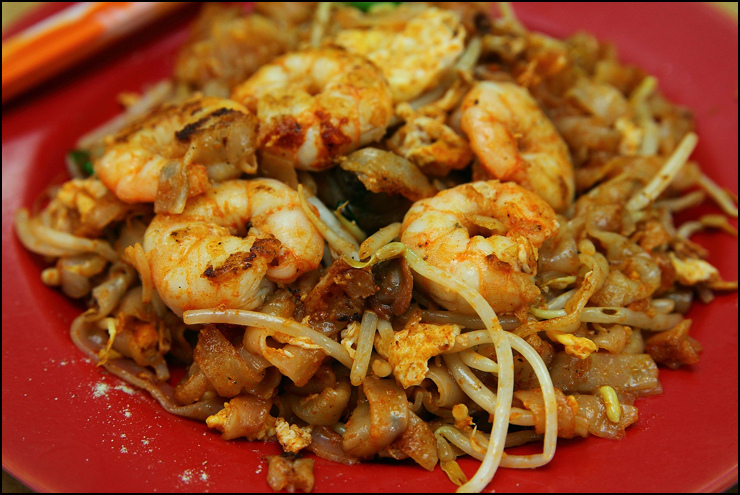 If you wish to have a fix of some authentic Penang Char Koay Teow, this is the place to be. There are countless Char Koay Teow stalls in Klang Valley that include the word ‘Penang’ into their stall name but the taste is always far from being close. After a while I just gave up the search totally. But recently a close friend managed to convince me to try Sun Hin Loong’s, because his recommendations usually won’t go wrong.If you wish, you could have extra prawns for an additional RM2 (normal price RM4.50) But do note that the number of prawns given are not fixed, more towards size I guess. So you could get 8 regular sized prawns or 5 large ones. Nevertheless, they are sweet and sea-fresh with a nice crunch, just scrumptious.